← Being popular is great. But is it costing you money? And indeed the retention work in the past was, as always, crucial. It usually focused on fine-tuning the VIP program of your brand and ensuring that your play makers were properly rewarded, even if in some cases this meant outrageous rakeback percentages. Because liquidity was king, you needed multitasking sharks to open as many tables as possible. Since the other rooms were paying the same, you couldn’t change that fact unless your brand name was composed of massive, luminous spheres of plasma held together by gravity (No Thomas, it’s not PokerMassiveLuminousSpheresofPlasma.COM – take another guess). But recently, a new trend has begun. As Poker lost its shine, and bad, bad people started taxing all sort of jurisdictions, there was hardly any money left to earn in this vertical, even for those gigantic rooms. So these days, the focus has shifted to the recreational player – the same guys usually referred to as “fish” by the pros. The guys who dared to have some sort of life away from the olive-green felt-covered tables. The first notable attempt to attract this crowd was done by 888 and their PokerCam Face2Face bells and whistles. Later they introduced several extra tiers geared toward the smaller players, which was a good step in the new, right direction. I do have a comment about their announced terms, such as: “The minimum amount that can be converted at any one time is $10; You can only convert your Reward Points total and not part of the total amount.” If you have to aim low, aim low – don’t talk. Still, 888’s approach was quite different from everyone else’s, and as with every good initiative, they were quickly joined at the gaming table by others. 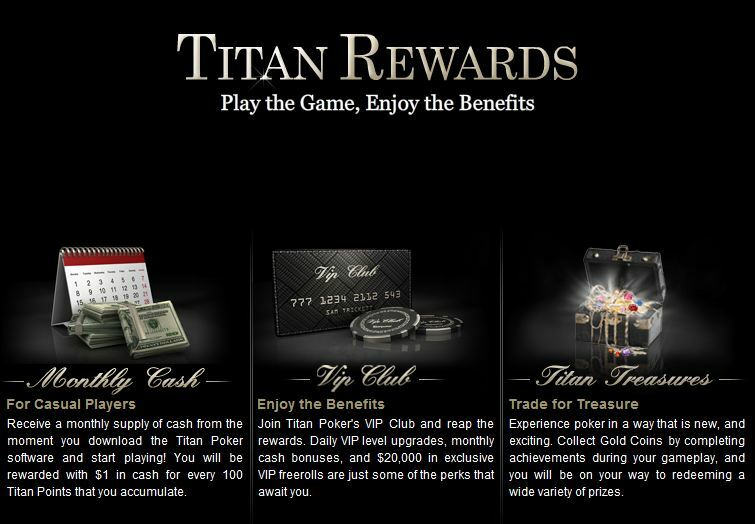 Now we have Titan Poker, one of the leading rooms under the iPoker network, totally revamping its loyalty scheme. They even have added a few sparkling gems for the players who login just to play Poker as opposed to turning this into their work place and a wet-escapade from life style of agonized solitude. So what’s the difference? They’re targeting the casual players that the old programs overlooked by instead focusing on the multi-tabling grinders. The idea is that the more points you accumulate, the easier it is to climb up to the VIP levels and vice versa, with a big emphasis on “Cash them in anytime you are ready”. And here is the first major nice thing: Players that earn less than 2,000 points in a month will see them automatically converted into cash at end of that month. So simple and logical – these are not players who could accumulate enough points to earn a large bonus or a sports car, so let them have their little cash, and live happily ever after. OK, if you keep your points until you have gathered a few hundred thousand, you do receive a higher cash-per-point redemption rate. That only makes sense. And consequently, the auto conversion is done at the lowest possible rate. But still, I am sure the 2-hours-per-week guys don’t even dream of moving up to the next tier, anyway. What about the more serious players? They get the usual VIP multipliers (using a much clearer tiers ladder), $20K in VIP Freerolls and daily VIP upgrades (Finally! They use to execute their upgrades on a monthly basis, but apparently they’ve discovered the Internet and such.) Nothing to get hung about. Which brings us to the next major thing that has the potential to catch fire across the industry – a casino-style reward system for Poker-playing activities, along with extra perks for winners: Titan Treasures. Titan now offers players a chance to collect “Gold Coins” that they can trade for Treasure Tickets. Those Treasure Tickets can be used for Cash Bonuses, Tournament Tokens, Club Points (and the other way around, BTW) or Poker merchandise. How do you collect these coins? Apart from the regular First Deposit/LIKE/Refer-a-Friend stuff, you can also earn them by … err, playing Poker. You got a full house? You get 300 coins. Four of a kind? That earns 3,000 coins. You play every day for seven straight days? Another 3,000 points. Sweet. And here is the thing: If you finish in the money at an S’n’G tournament, that’s 50 coins, but do that three times in a row and it’s worth 500 coins. Same goes for cash play: A two-hours session is 500 coins, yet three consecutive sessions are 2,000 coins. Poker sites have always prided themselves for being service providers, not caring who was winning and who wasn’t because they earn their cut from rake and fees. I like the fact that when the business climate is shaky, people are willing to rethink base principles and are willing to consider other alternatives. The choice between being creative and becoming redundant is quite clear. So what’s wrong? The minimal ticket costs 10K coins. That’s awful lot, and it’s worth only UP TO $20 in value. The most expensive one is worth $1,000 (POTENTIALLY), yet is conveniently priced at 100K coins. Apart from referring a friend (40K coins), you don’t really have any major means to quickly earn coins. And of course, in terms of cost-per-reward from Titan’s point of view, that’s fantastic. But wait a second, what is this “up to” terminology? After all of these praises, has Titan pulled a Raffle? To be honest, I wasn’t able to find a clear answer on this (even within the T&C), and I really hope I am wrong and that players are rewarded per ticket (as per its face value), rather than a shady “EVERY Ticket WINS!”. Again, I really do like Titan’s rejuvenated Poker offering, especially with this bold focus at the untapped “Fish Market”, but in terms of actual value to the end-user, this can ruin the entire experience. In today’s world, customers prefer terms they can bank with, on top of pure luck. Will the players hate it or appreciate it? I am sure plenty of them will enjoy collecting the coins (regardless if they win something from it or not! ), as it does have some sort of Social/Farm appeal to it, and anyways – elsewhere they are used to get nothing at all… Will it be enough to keep them coming back again and again? All we know at this point is that, much like the world in Stephen King’s “The Dark Tower”, the Poker industry has moved on, and things aren’t the way they were before. Would you adopt such an approach in your room as well? Use the comment box below to let us know what you think and, if you like, make some suggestions for ways to tweak the incentive yet keep it attractive. P.S. : In just few days (May 10), eGR will hold its prestigious B2B Awards Ceremony, with Hybrid Interaction being shortlisted for the “Retention Partner of the Year” category. Support us by spreading this post!